SpongeBob still matters. Perhaps this movie’s lasting legacy will be that he was the one to finally take out American Sniper at the #1 position at the box office. Granted director Clint Eastwood’s production held the spot for 3 weeks but still you’ve got to hand it to the little sea dwelling invertebrate. The Nickelodeon TV series, currently in its 9th season, has been around since 1999 so the novelty factor is gone. 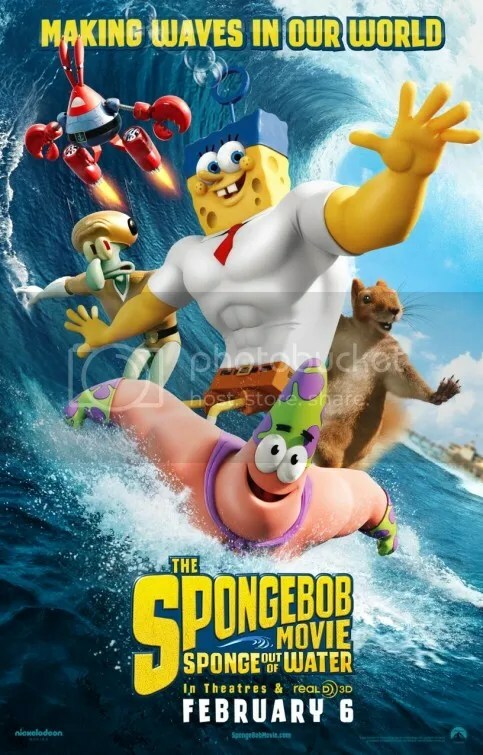 A first feature, The SpongeBob SquarePants Movie, was released in theaters in 2004. Now 11 years later we get a sequel that thankfully doesn‘t rely on having seen the original feature. Regardless of what naysayers griped about the supposed decline of the TV show, it didn’t seem to affect reception to the film. A $55 million debut weekend is pretty impressive. Even the final installment of The Hobbit debuted to less. The plot is totally ridiculous. It starts off in the real life world with a human pirate (Antonio Banderas) who obtains a magical book. As he starts to read we enter SpongeBob’s animated world and begin another story. Fans acquainted with the series will be greeted with familiar elements: the city of Bikini Bottom, fast food chain – the Krusty Krab, his friends: Patrick Star, Squidward, Mr. Krabs, Sandy Cheeks. Arch nemesis Plankton wants to steal Spongebob’s secret recipe for tasty Krabby Patties as per usual. They have a tug of war over the paper containing it and it magically vanishes because uh, because uh, it just does. If you’re asking how or why then you might have an issue with this nonsensical adventure. All things considered, Sponge Out of Water is an entertaining flight of fancy. I couldn’t follow the story but then again I don’t watch the cartoon. I’m clearly not the target audience. It’s not that it’s complicated. It’s just that it’s a really slapdash, haphazard affair. This is one of those films where you must put your brain in neutral and delight in the pure zaniness up on the screen. For example, the absence of delicious Krabby Patties thrusts the town into a post apocalyptic state. The plot includes time travel and meeting a talking dolphin named Bubbles. Pharrell Williams contributes 3 songs to the soundtrack including “Squeeze Me” which plays in the background whenever they zip through time. The two worlds, one featuring Burger-Beard the pirate and the other, SpongeBob, ultimately intersect. It spoils nothing to reveal this because the title, the poster and trailer all promise this event. The extended sequence where SpongeBob and his pals take to dry land in the physical reality of real people is indeed enjoyable. I must admit that in the beginning, I was thinking too much for this story. However once I had bought into the craziness, then I was up for anything. That’s when I enjoyed it. This entry was posted on February 12, 2015 at 7:51 am and is filed under Adventure, Animation, Comedy, Family. You can follow any responses to this entry through the RSS 2.0 feed. You can leave a response, or trackback from your own site. I think kids will love this. It was corny enough to enjoy, but I agree, the story was a little scattered. 3 1/2 stars. Yes kids. It’s absolutely bonkers. On a related note, I think stoners will enjoy it too. I haven’t watched the series or the first movie but I think the trailer looks pretty good. Your review has convinced me that it might be worth a try. Can’t believe that SpongeBob knocked American Sniper off from being #1 at the box office. Like you said, it’s a testament to the character’s lasting relevance. I’m also not the film’s target audience, so I’m not rushing to see it. The plot sounds zany, but in a turn your brain off, fun kind of way. I could deal with that. It’s currently the 2nd biggest hit of 2015. You should definitely review it.